The optical sensor, developed in collaboration with a group of ITODYS, is a molecularly (or nanoparticle)-imprinted polymer inverse opal, that is an organized structure of air spheres surrounded by a stimulable polymer matrix (Fig. 1). 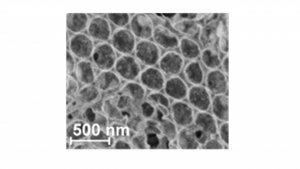 The polymer is a hydrogel containing specific nanocavities corresponding to the target nanoparticle with which the polymerization has been performed. The reuptake of this specific nanoparticle induces a swelling of the polymer (“key-lock system”) which modifies the inverse opal periodicity and consequently its optical response, measured for example in reflection spectroscopy. More precisely, for a given incidence angle of a white light beam, the increase of the air spheres diameter leads to a red-shift of the reflection spectrum (Fig. 2). This system has been successfully used to detect nanocrystals (see highlight).